what it looks like on the inside. finshed cake, i didn't let it firm up, so it's melting. after it's been cut into. This was so good, I had to post 4 photos. My cousin Michelle first told me about this recipe. 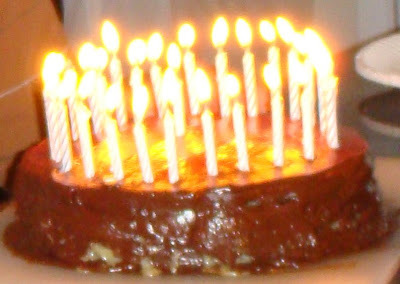 And since Pepe's favorite cake is German Chocolate, I decide to make this for his birthday last year. It took a long time and I didn't let it cool, so it was sort of a gooey mess, but the filling, was oh so good! 1. Preheat oven to 350 degrees. Butter two 9-inch springform pans. Line the bottoms with parchment paper, and butter the paper; set aside. Place chocolate and butter in a heatproof bowl, and set over a pan of barely simmering water. Stir occasionally until melted; set aside. 2. Sift together flour and salt; set aside. Place sugar and eggs in the bowl of an electric mixer fitted with the paddle attachment, and beat until fluffy and well combined, 3 to 5 minutes. Add vanilla and chocolate mixture, and stir to combine. Add dry ingredients, and stir to combine. Divide batter between the two pans using an offset spatula to distribute batter evenly, and smooth the layers. Bake until the center is set, about 20 minutes. Transfer pans to a wire rack to cool completely before unmolding. 3. Place one layer on a 9-inch cardboard cake round. Spread filling over the layer, and invert the second layer onto the top, leaving the smooth side up. Press down gently on top layer to evenly distribute filling to edges. Using a metal spatula, smooth filling flush with sides of cake. Refrigerate until ready to glaze. 4. Carefully transfer torte off cardboard round onto a wire rack set over a baking pan. Pour enough ganache glaze over cake to fully coat, shaking pan gently to help spread ganache if necessary. Let sit for 15 to 20 minutes. The ganache in the pan may be melted and strained through a fine sieve and added back to glaze. Pour remaining glaze over torte, allowing excess to drip off sides. If top is not smooth, gently shake pan or run an offset spatula quickly over surface. Allow to set at least 30 minutes before serving. Carefully slide the cake off of the wire rack and onto serving platter. Makes about 2 cups, enough for one 9-inch Torte. 1. Place milk, butter, and vanilla in a medium saucepan, and cook over medium-low heat, stirring occasionally, until melted and combined. 2. Whisk egg yolks in a medium bowl, and, whisking constantly, add some of the hot milk mixture to the egg yolks until combined. Whisk the mixture back into the saucepan, and cook, stirring constantly with a wooden spoon, until the mixture thickens slightly, about 5 minutes. 3. Remove from heat, and stir in coconut and pecans. Cool completely, and refrigerate in an airtight container until ready to use, up to 2 days. This is so good, I could just eat this. Chop chocolate finely using a serrated knife; place in a large heat-proof bowl. Bring cream to a boil over medium-high heat; pour directly over chopped chocolate. Allow to sit 10 minutes. Use a rubber spatula to gently stir chocolate and cream until well combined and smooth. Let sit at room temperature until cooled and just thickened, stirring occasionally, about 30 minutes, but up to an hour depending on the temperature of the room.